Great Eccleston and Exceptional Kitchens were weekend winners in the Bathrooms Solutions Blackpool and Fylde Sunday Alliance premier division. Exceptional Kitchens beat this season’s Lancashire Cup and Gledhill Cup finalist Eleven Sports Media, moving out of the bottom two with five goals from Kyle Hendry giving them a 5-4 win. Eleven Sports Media’s players must have one eye on both cup finals as the league is now out of reach despite doubles from Will Robinson and Arran Fleming. Great Eccleston’s 3-1 win over Bloomfield Brewhouse FC saw them leapfrog their opponents in the table. Nick Webster, Sam Banister and Dave Mendonca gave Ecc victory, with Daryl Hall scoring a consolation for Bloomfield, who are without a win in their last six games. In division two, Layton Seniors went second on goal difference ahead of AFC Lane Ends thanks to an 8-1 victory against Marshall Court. An Alex Ryder hat-trick and goals by Harry Lee (2), Martin Campbell, Ben Rader and Nathan Baily sealed a convincing victory for the Layton side. Melling Cup action saw the battle of the newly-crowned division one and two champion. A hard-fought contest ended in a 2-2 draw, with Lee Grundy and Liam Dowell on target for New Albert and Jack Williams scoring twice for the Mount. There were also victories for Bloomfield and Blackpool Elite in the same competition. Bloomfield got the better of first division side Westview, winning 4-3. John Whittle (2), Adam Hawkes and Robert Heritage scored the goals which gave them victory, despite Ellis Tester, Sam Firman and Daniel Sumner all netting in reply. Blackpool Elite were already flying high after reaching the Berry’s Beds division cup semi-finals. They continued that form at the weekend with a 6-3 win against Highlands courtesy of goals from Luke Davison, Kyle Housley Kieran Scott, Dillon Conlon and Josh Peat (2). Lewis Loftus scored twice, with Chris Jackson also finding the net but it was not enough to keep Highlands in the game. Thornton Cleveleys hauled themselves to within a point of the league leaders in the West Lancashire Football League Premier Division with a 2-1 win against Hurst Green. Oliver Wilkinson was their two-goal hero, putting them ahead from the penalty spot shortly before half-time and then netting the winner in the 85th minute after Oliver McLean had pulled one back for the visitors. There was also a late winner for Poulton as Max Landless netted seven minutes from time for a 2-1 win over Whitehaven. They had to come from behind to seal the three points after Gregg Armstrong had netted a 34th-minute spot-kick for the away side. Josh Few got Poulton back on level terms before Landless’ late winner, which now sees Poulton climb up to fourth. In Division One, there was a major blow for title challengers Lytham Town as they were beaten 2-0 by Millom. 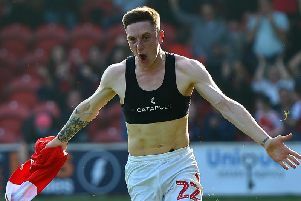 The game appeared to be heading to a stalemate but Jamie Pattinson broke the deadlock six minutes from time before Chris Wood made sure of it in the final minute. It means Lytham remain in second, a point off CMB, with just one game of the season left to play. CMB travel to fourth-placed Hawcoat Park next week knowing a win will seal them the title. Wyre Villa found themselves on the wrong end of a nine-goal thriller in their final game of the season at Eagley, who claimed an extraordinary 5-4 win. It means Wyre finish the campaign second from bottom in Division One. It was heartache for Blackpool Wren Rovers in the semi-final of the Richardson Cup, where they were beaten on penalties by Turton. They had earlier drawn 1-1 in normal time, Brett Dawson scoring for Wren Rovers while Luke Bradbury bagged Turton’s goal. It was the visitors who edged their way into the final, winning 3-2 on spot-kicks.